Benetti’s magnificent and award-winning 60m/197ft superyacht called St David is a beautifully designed and built motor yacht. Her interior displays the hallmarks of one of the yachting world’s best interior designers, no less than the widely celebrated Andrew Winch, and her overall design maximises space, freedom and lifestyle. With three spacious decks yacht St David has multi-dimensional space to entertain family or friends. From watching movies under the stars in the outdoor cinema to a huge variety of water sports, this superyacht has it all. She sleeps up to 12 guests in six functional, well designed and furnished state rooms including a master suite, one VIP state room as well as four guest retreats. Images courtesy of Yacht St David and Benetti. St David was launched in 2008. Designed by the British designer Andrew Winch she was launched as the fourth hull in Benetti’s 60m series. She featured in the Antigua Charter Yacht Show at the Falmouth Harbour Marina and is said to be a perfect charter yacht. What an impressive figure she cuts with her gentle curves and streamlined profile sparkling in the Caribbean. In the summer months, St David itineraries will take you to the Mediterranean while in the winter, the Caribbean. You can decide where and when you want to go at your own pace and to idyllic destinations that suit you. Escape to your favourite spot or discover something new as you cruise along at 13 knots. Sail to the French and Italian Riviera, Cuba, the Virgin Islands or along the Amalfi Coast. Designer Andrew Winch designed the opulent interior of this yacht to blend perfectly with the practical spaces. The idea was to create space for a whole host of activities with an interior inspired by romantic, elegant and large Italian hotels. Luxurious escapism is what’s on display throughout with intricate marquetry, marble and glittering mosaics. Guests can expect a warm welcome when boarding St David through the curved doors at the aft deck. This acts as a precedent of what is to come. You won’t fail to be impressed with the checked marble flooring, central compass motif and a fantastic cocktail bar to port. What a divine area to sip drinks in comfortable, wingback armchairs. The St David’s interior lavish charms in the main saloon certainly delights. The high gloss wood in the bar is replicated in the cabinetry and wall panels - exquisite. Soft white carpets with borders of pink flowers replace the marble floor in the dining rooms and lounges. Relax on one of the four sumptuous sofas in peach, gold and white fabric that face a coffee table to create the perfect social seating area. The table and chairs are upholstered in gold damask and complete the formal dining set up superbly. Oil on canvas paintings by the muralist Michael Alford are on display along with sparkling glassware, fossil ornaments and amazing candelabras. A sweeping staircase will certainly capture your attention especially with its intricate marquetry made from soft satin wood. Natural light filters through a glass bottom spa pool on the sundeck to lighten up the space even further, what an effect. The opulent accommodation consists of one master suite with a king size bed, a VIP suite with one queen size bed including four twin and double guest rooms. The master suite lobby is adorned with four glass etched panels of charts that shows destinations St David has chartered in. These depict Corsica and Sardinia, the Peloponnese and the Windward Islands in the Caribbean. A short corridor leads off the lobby to this master suite. Sturdy sliding doors provide all the privacy you need. In the lounge, you will find a corner sofa and armchair upholstered in ivory damask. The sofa faces a wide screen TV, ideal for watching your favourite programmes. An en suite bathroom is situated to port. With a spa-like feel, the bathroom features an eye-catching sand coloured Italian marble bath complimented by a his and her sink. The checked marble floor is in grey and amber. There are also two showers for guests to use. The St David sleeping quarters can be accessed by a short staircase which has a stunning gold balustrade. The skylight above provides spectacular views as you sail to new horizons and beyond. Look up at the hand painted ceiling mural by the Italian Luca Battini. Painted in a soft pastel blue and gold leaf, it matches the soft furnishings and carpet perfectly. Interior designer Andrew Winch has achieved what he intended to do. His Rocco style of design incorporates soft colour schemes and plenty of natural light. To reach the four guest state rooms, go down the central staircase to the lower deck. Here there is a fabulous globe sculpture, designed by David Harbour, in 24 carat gold, a masterpiece indeed! This globe is used as a drinks cabinet with an exterior depicting the mythical land of Xanadu. Just as a matter of interest, the motor yacht St David was named after the designer of this outstanding globe. A VIP suite is situated stretching across the full beam of the lower deck. This comprises of a sofa, desk, spacious mirrored closets and a large bed. There’s also a huge bathroom decorated in grained gold marble. Further guest accommodation comprises of two twin and two double cabins. They are named after Italian hotels and are furnished in different colours ranging from pastel green to cream, gold to rose. Each of St David’s cabins is extravagantly lavish with luxurious marble bathrooms and individual pieces of stunning artwork. Let’s turn our attention to the upper deck. The aft deck and sky lounge located here are known as the Tuscan palazzo. With light wooden wall panels, this lounge has a jaw-dropping, bright, airy feel while still providing a touch of romance in its décor. In pastel green, there’s a built-in sofa and to complete the scene, a wooden topped coffee table. A widescreen TV and games table is situated opposite alongside an inside-outside dining area. The delightful inside-outside dining area has a wooden table, a lovely mosaic floor in turquoise, white and gold tiles and seats 12 people comfortably. The sunlight filters through a sky light located above the seating area. For guests who enjoy dining al fresco, there are wide, curved glass doors that slide open so you can overlook the aft deck. Expect to indulge in the finest dining experiences on board the St David. 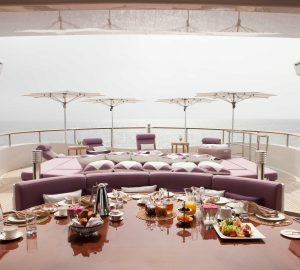 Have a spot of breakfast or lunch on the top deck or an afternoon tea in the relaxing sky lounge. Socialise in the main saloon for the very best gastronomic dining experience. The upper deck is also a multi-purpose entertainment area with a staircase to port that goes to the sundeck above. The versatile sun deck is a daytime and after dark hub of activity on any charter yacht. St David is no exception. During a yacht charter voyage many guests like to keep up their exercise routines. On the St David removing the forward sun pads reveals two Woodway running machines, an exercise bike and exercise machine. What could be better than working out while enjoying the splendid views? There’s also a gym at the port side of the radar arch with all the equipment you need for a full-on workout. Speak to the onboard personal fitness instructor about training. He or she can guide you through a workout tailored to suit your needs. Fitness activities are varied and fun to do. This could include boxing training, circuits, paddle board fitness and even hiking on shore. After exercising, relax in the large spa pool. A screen serves as a monitor for outdoor movies or you can watch popular sporting events as you relax in the bubbling Jacuzzi. Now that sounds like heaven on earth. Other features on the aft deck include a large round dining table under the radar arch. Want to do a little more sunbathing? Step up to a second sunbathing area where you will find brightly coloured parasols and comfortable chaise loungers. 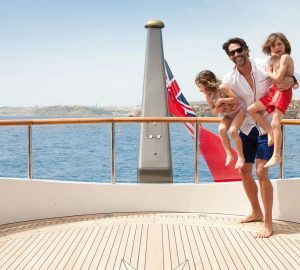 St David is a superyacht designed for luxury family adventures and outdoor living at its very best. The dedicated crew will welcome you on board to make your home from home vacation unforgettable. This popular superyacht is also known as one of the best party yachts in the world of yacht charter. When the sun sets, it’s time to party. The sundeck can be changed into an exciting entertainment spot where seating is removed to create space for a DJ. The plinth of sun pads can also be removed to make additional space for a stage to host a live band. If you prefer, why not sing along using the portable Karaoke system? Soak up the atmosphere as the fun factor goes up a notch, it’s what superyacht partying is all about. The dance floor is in easy reach of the bar where the disco lights and sound system helps to complete a night club feel. If you want to tone things down a little, formal entertainment is also catered. Modular furniture can seat up to 24 guests for a sit-down dinner and drinks. Now it’s time to recharge your batteries after a night of partying or a day of water sport activities. On board masseuses offer a variety of spa treatments. These treatments include invigorating full body exfoliation and pampering sessions. To improve circulation, have a Swedish massage or a signature lift and firm leg massage. How about an express manicure or pedicure? A private spa room is on the upper deck where guests have the option of many different beauty or massage treatments. There’s easy access too to a large swimming platform to dive into the crystal-clear waters. 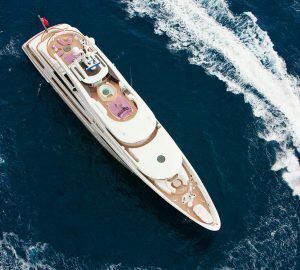 As you would expect from a superyacht of this calibre, a great selection of water toys is available. Have the time of your life on Seabobs, a Seadoo, sea kayaks or an awesome 7.5m Tresco “limousine” tender. For children, St David also has a range of towable toys, inflatables and inflatable paddle boards, great fun. Diving and fishing enthusiasts are catered for too. The St David has plenty of equipment to while away the hours either scuba diving or fishing. St David definitely fulfils all the criteria required of a charter yacht. She is well equipped for guests whether it’s exploration, relaxation, fine dining, partying or working out. Rest assured the attentive crew will deliver an on-board service like nothing you’ve ever had before. 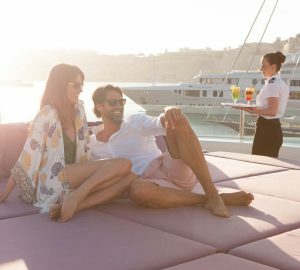 Experience romantic escapism, a genteel atmosphere, calm serenity and above all, style, on board motor yacht St David.